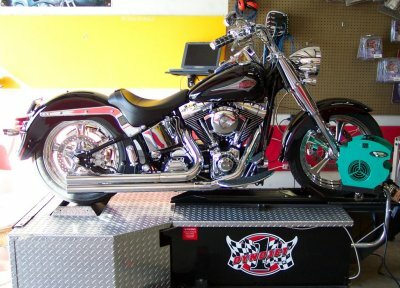 Steve had a cool Fat Boy, which we customized quite a bit... PM Wheels, Custom Lights, Tons of Chrome.. The works! All That Was left was to make it run... So to his machine we have applied a simple yet proven treatment to make her run. 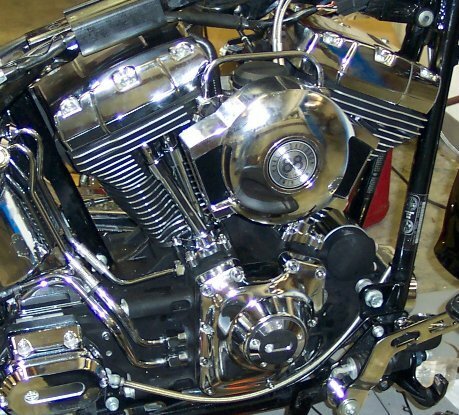 Our formula is Genuine 95CI HD Cylinders, pistons & cams, some solid yet simple porting, polishing and flow tricks by Redman Machine, and a good ignition. We have done this many times before and expect anywhere from 87 to 103 H.P. with gobs of torque right off the throttle. The best news is this package is basically bullet-proof and is reasonably priced (under $2,500 complete). First a baseline dyno run is done. The numbers came out to 68.6 HP and 80.2 Lb/Ft torque. This is typical of a TC-88 with a breather and some pipes. 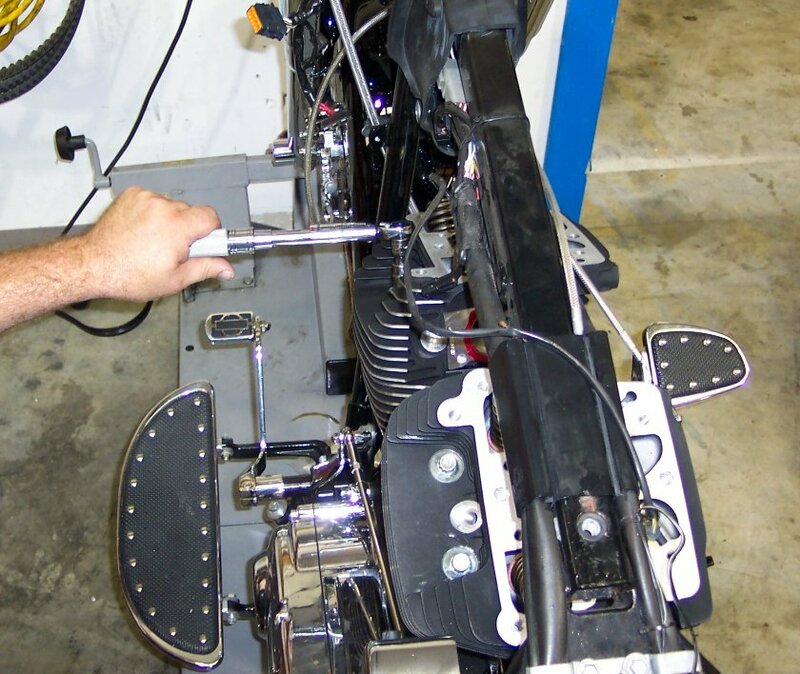 Disassembly starts by disconnecting the battery, draining and removing the tank. 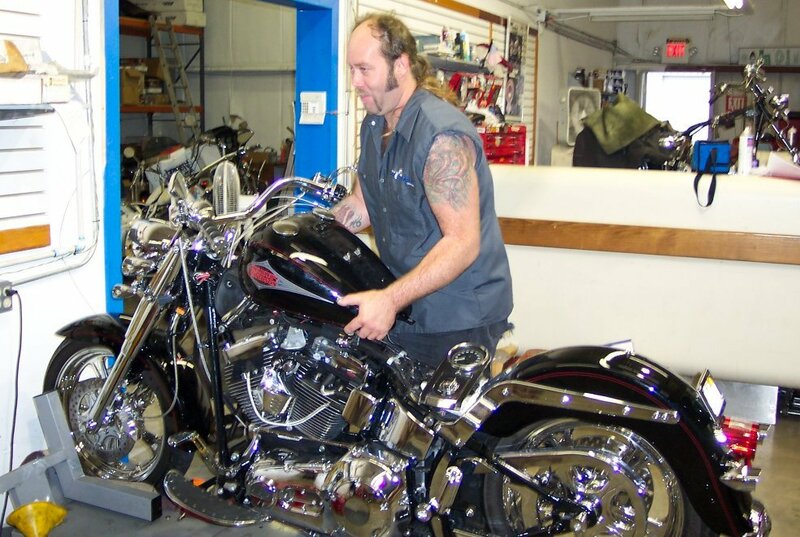 Next Dana removes the exhaust system, the carb, heads and cylinders. The cam cover is next. 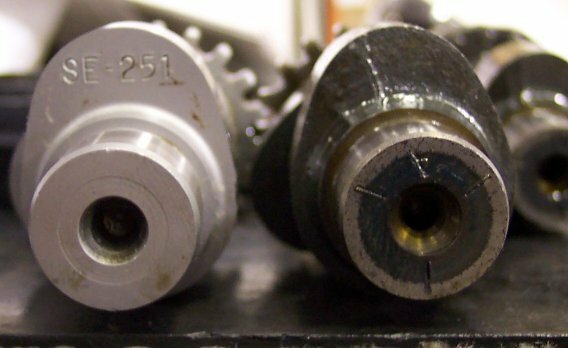 You can see here the Cam gears and chain are removed once the tension is off the chain. The last shot shows the engine naked, with the cams removed. Notice the magnets in the lifter blocks. These hold the lifters up to clear the cams. Here is the good stuff !! 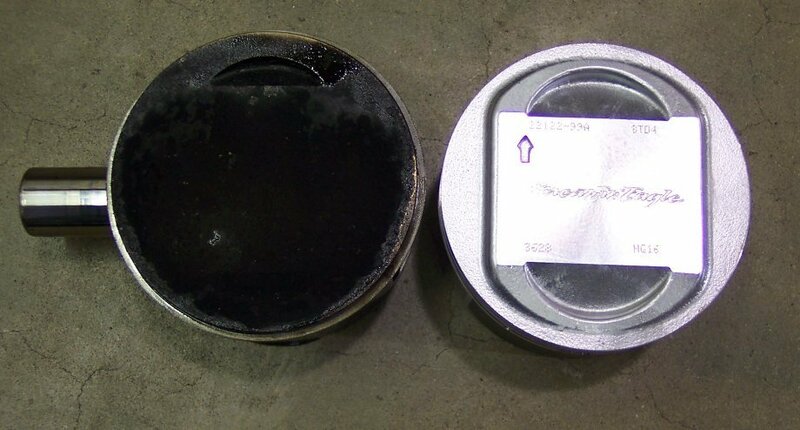 Harley's high compression cast pistons... Hard to tell the size difference from the picture, but you can see the valve pockets. A look at the cams reveals a much higher lift, a much faster opening and closing as well as good deal longer duration. These things allow more of the good stuff in and out, producing more power. The heads have stronger springs, a 3 angle valve job and have been ported and polished. This means the air/fuel flow both in and out has been massaged to increase speed and reduce restriction. On the flow bench these flow about 145CFM, significantly more than the stock head. Realize that these are not replacement heads... just worked. This is much more economical than replacing the heads. It's time to put this back together! Dana uses a press to press the old cams out of the cam support plate, and to press the new cams in. All the bearings are replaced with new ones. 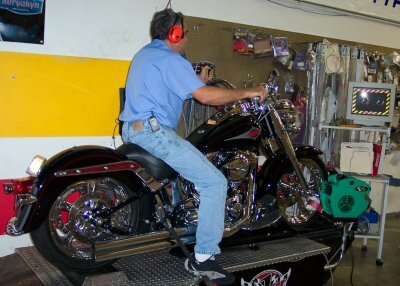 Special tools are used to remove the inner bearings as well as install them. 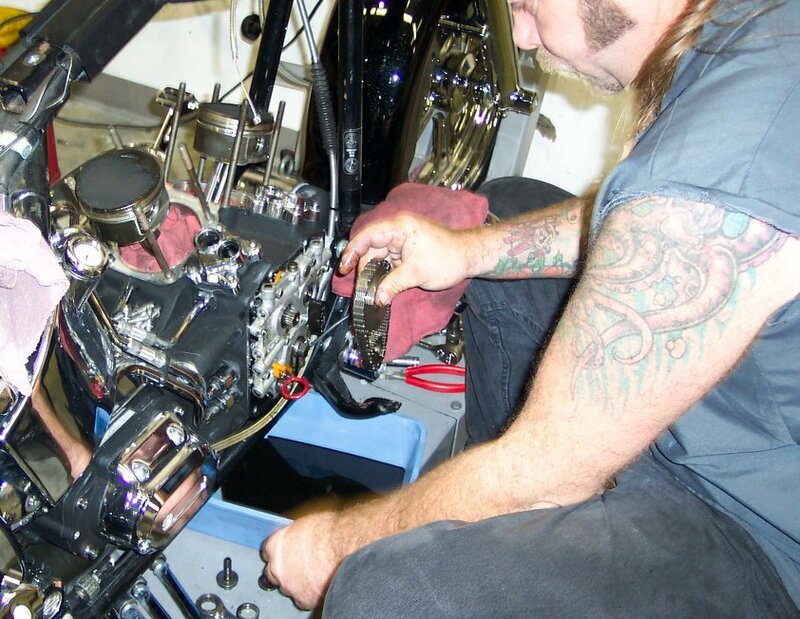 Here Dana uses the installer that bolts to the case, and the long threaded rod installs each of the bearings precisely. 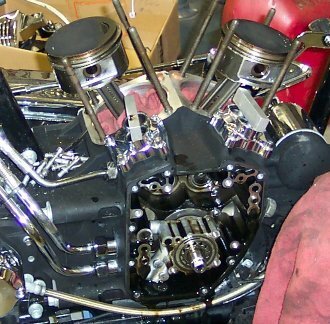 The new pistons are installed on the rods. 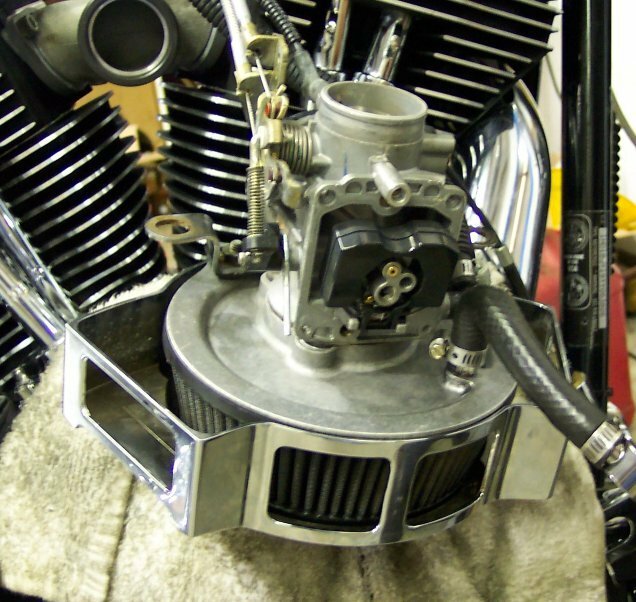 Here you can see the rubber that protects the piston (front), while a ring compressor allows the installation of the rear cylinder. It's time to button this baby back up! The cylinders have been installed, as well as the heads. Dana now torques the heads as per the factory manual. We choose to use the stock pushrods. They are strong and the correct length. The middle picture shows the motor all together, the pipes & tank are the last items to be re-installed. 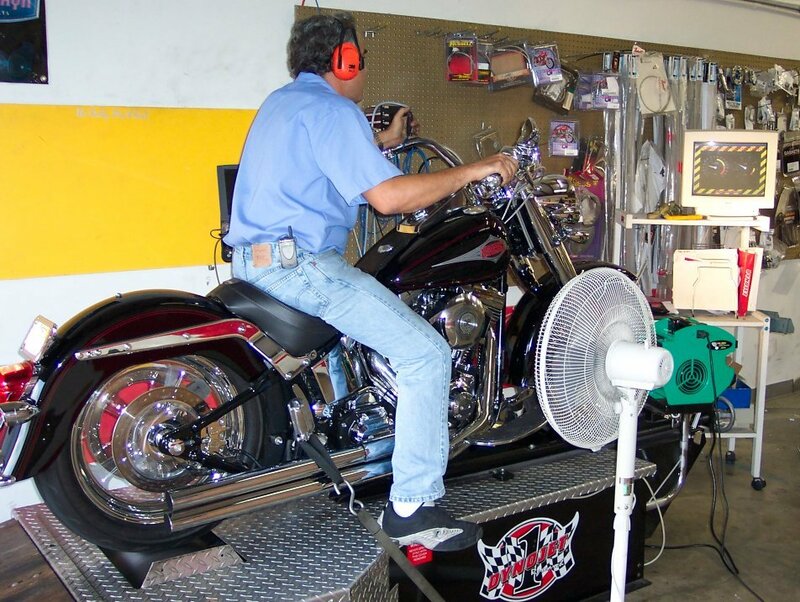 Fluids are re-filled and after installing the Crane ignition, This bike is ready for a test drive! After some break in miles it's back to the dyno. We were looking for something around 95HP and 100 LB/FT of torque. 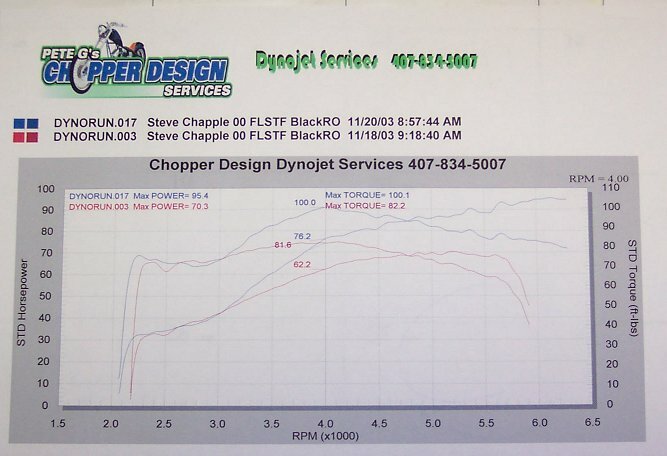 Steve had some junk plug wires, so we used a high-performance 8.8MM Wire and started to tune the motor on the Dyno. 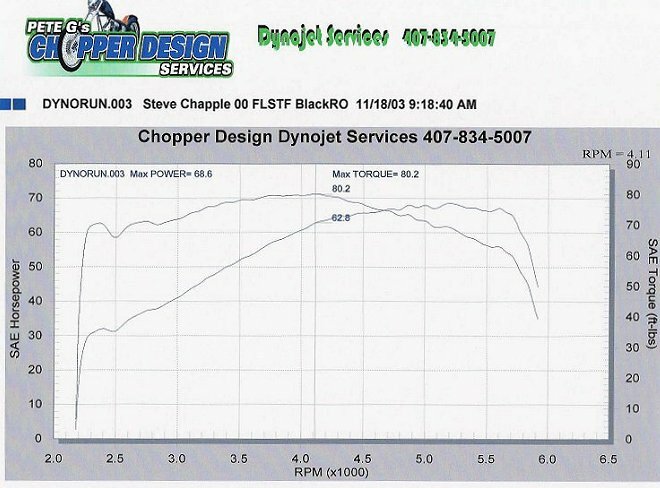 First runs showed us around 90HP and a big dip early in the torque curve. 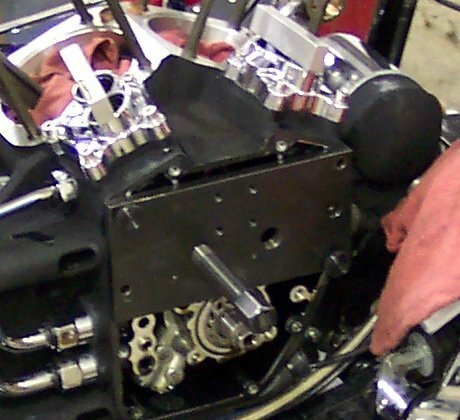 With some fine tuning on the ignition module , a few jet changes to the carb, and a set of cut off baffles for the Sampson 2 1/4" pipes, we finally got what we wanted on the 17Th pull. 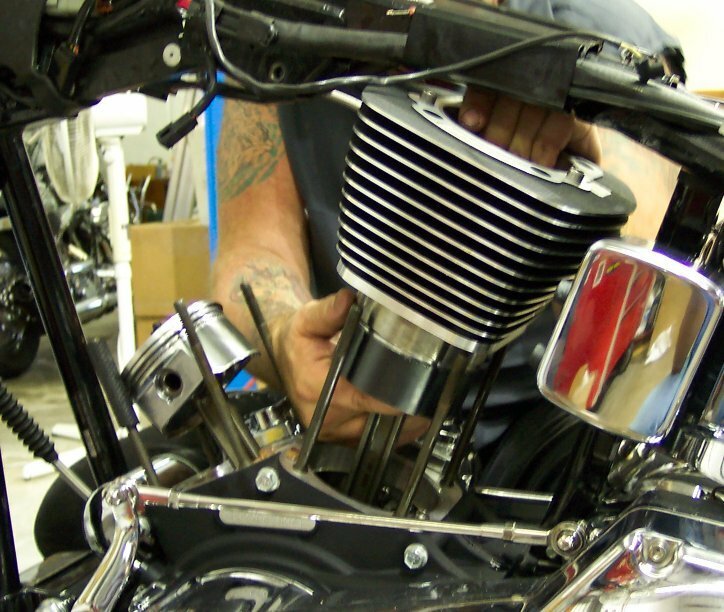 More than the peak numbers, we have a motor that delivers over 90 lbs/ft from 3400 to 5200 RPM. This bike pulls real hard, and the parts are very reliable. 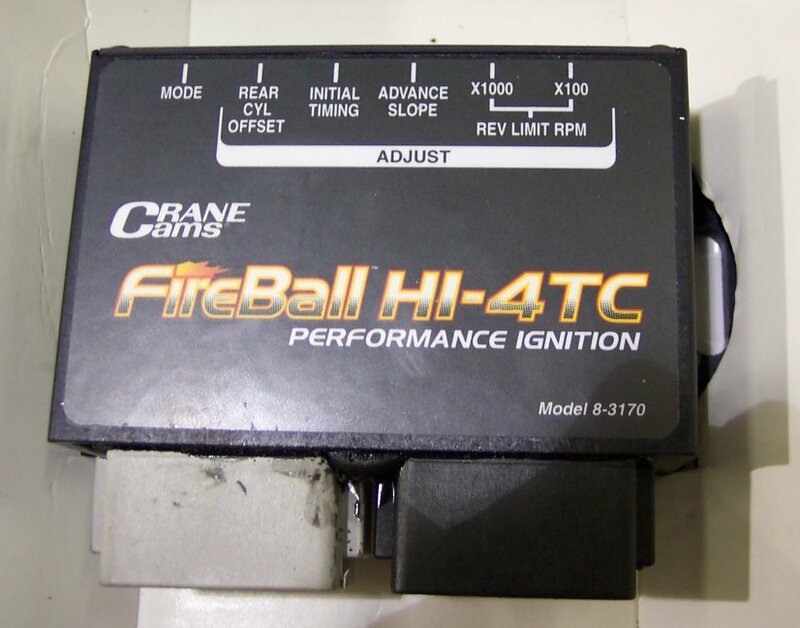 No doubt we could build a motor with more horses, but this conservative approach provides GREAT performance and exceptional reliabilty, at a reasonable price. Your mileage may vary!